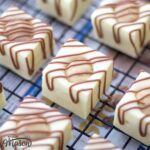 Finding a good white chocolate fudge recipe and making it always used to seem difficult until I discovered a SERIOUSLY easy ‘cheat’ way of doing it… in the microwave!! This CRAZY delicious milk & cookies chocolate fudge recipe is SO easy to make you could probably do it with your eyes shut! (Although I don’t really recommend actually doing that…) All that’s required are a few ingredients, a microwave & a bit of mixing. That’s literally it. I promise, it takes 10 minutes MAX. Don’t believe me? It’s not my first time… check out my White Chocolate Cookie Dough Fudge recipe, you’ll love it just as much! 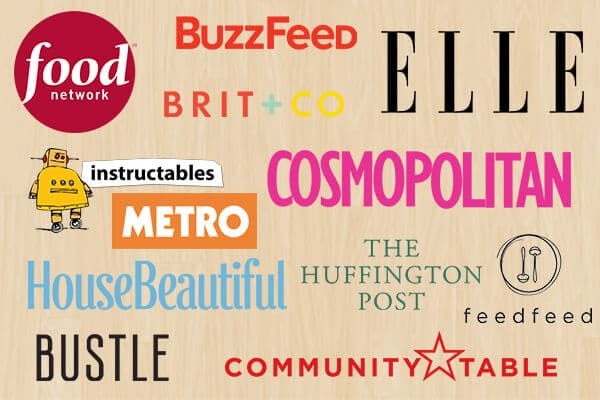 Still think it sounds too good to be true? Well you’d be wrong there my lovely! Keep reading to follow my gorgeous white chocolate fudge recipe with ultra easy step by step picture instructions and make some of your very own! Using an authentic chocolate fudge recipe is quite different to using this one. Authentic fudge is generally made by heating cream, sugar and butter up to 116°C in a pan (Almost always checked with a thermometer) and it can take quite a bit of time and faff if you don’t know exactly what you’re doing. 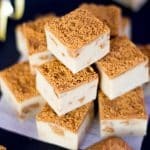 Don’t get me wrong I absolutely LOVE traditional fudge, particularly the vanilla variety, but i generally just don’t have the time to make it! We’re all so busy in our modern day lives nowadays that spending hours over a saucepan just isn’t feasible anymore. 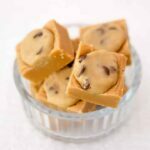 That being said, if you do have the time to go traditional, I’ve also got an awesome vanilla cookie dough fudge recipe for you too! So if you’re on the lookout for an easy white chocolate fudge recipe, this is for you!! 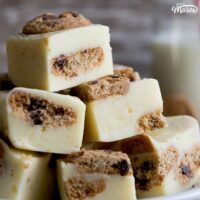 Using only 5 ingredients and 5 minutes of your time, it really couldn’t be easier for you to make gorgeous milk and cookies fudge. There’s not even any chopping to do and the flavour is just incredible – so creamy! It’s loaded with mini choc chip cookies too, making it taste like you’re dipping your cookies straight into a glass of milk! Erm, yes please. Go easy when you’re melting the ingredients at the start of the recipe, you don’t want to make the mixture too hot. (Chocolate doesn’t like it!) So just heat in short bursts and stir well between each time so you can keep full control over it. Use a silicone tin so you don’t even have to line it! Once set, this fudge should just pop straight out with no effort at all. 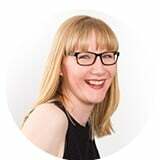 Against all the odds – is your fudge still sticking to your silicone tin? Pop it into the freezer for 20-30 minutes and try again. Problem solved! Want to turn your fudge into beautiful gifts? Place some, in a single layer, into cellophane food bags and tie with ribbons. Make sure to tell the recipient to store it in the fridge and consume within 5 days. Et vout voila – a lovely homemade gift! Here is what you will need to make 36 bite size pieces. If you are using a metal tin, lightly grease and line all the way around with baking paper so the fudge doesn’t stick. 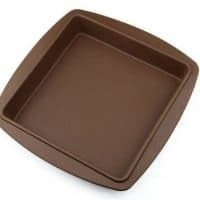 If you are using a silicone pan, you don’t need to bother as the fudge should easily come out. Firstly, break the white chocolate into a large microwavable bowl then add in the butter, condensed milk and vanilla extract. Now heat in your microwave in 10-15 second intervals and make sure to stir well between each time with a spatula. Keep heating/stirring until it’s all smooth and melted. Not got a microwave? No problem! You can simply put all the ingredients in a large saucepan over a low heat and achieve exactly the same thing. Just make sure to stir it constantly with a wooden spoon so nothing catches on the bottom and burns. And that’s the fudge part done. See – didn’t I tell you how ridiculously easy this was?! Now it’s time for the cookies! Carefully stir all bar about 8-10 of the cookies through the white chocolate fudge. If you got some on your fingers, it’s totally ok to lick it off… Tastes good doesn’t it?! Back to business – now we need to pour that fudge into your prepared tin/silicone pan and smooth it out as best as you can with a spatula. Finally, take those cookies we reserved before (if you haven’t accidentally eaten them) and randomly place them over the top. Give them a gentle but firm press into the fudge so they stick well. And that’s it! All you need to do is pop your milk and cookies fudge into the fridge for 4 hours (or overnight) to set completely before removing from the tin. When it’s ready, simply slice into 36 pieces by cutting in a 6 x 6 grid. Store your beautiful homemade fudge in your belly, sorry – I mean an airtight container in the fridge and consume within 5 days. 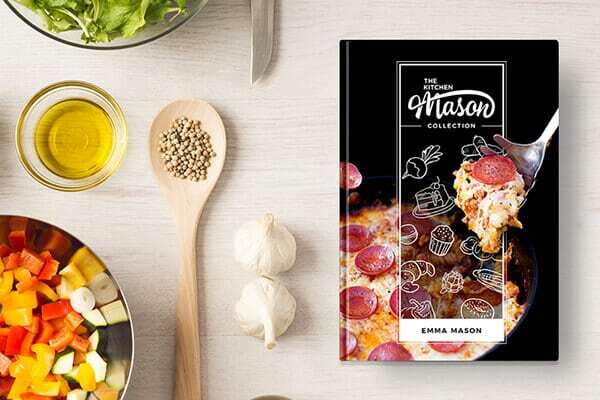 How much would you absolutely love it if you received this as a homemade gift or someone offered you a piece when you went to their house/party? You’d totally love it right? Me too!! It really is beautiful and I just adore how wonderfully simple it is to make. What’s your favourite foodie gift to make or receive? Let me know in the comments below! 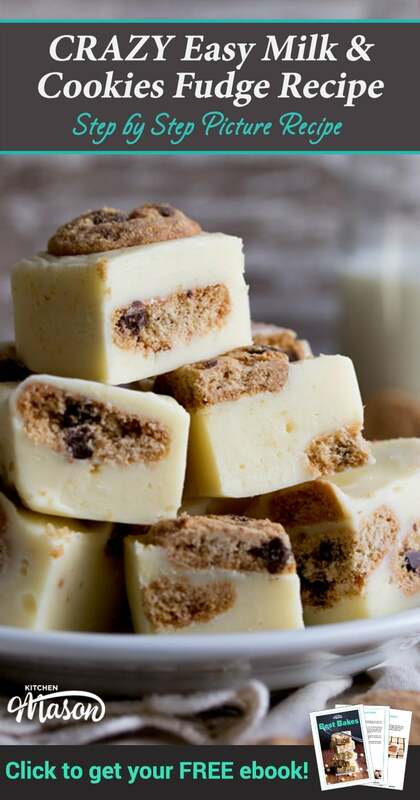 Indulge yourself with this irresistibly tempting Milk & Cookies White Chocolate Fudge. It's SERIOUSLY easy to make and tastes amazing! Add all the ingredients except for the cookies into a glass bowl. Mix in three quarters of the cookies then pour into the tin/pan and level out. When set, slice into 36 pieces. 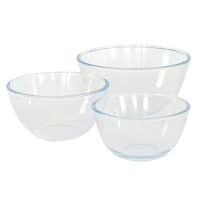 Store in the fridge in an airtight container and eat within 5 days.